Save money on this Dealer Special! Due to the current massive levels of our inventory this vehicle's price has been dramatically reduced to move by month's end! This particular vehicle has been reduced below the retail market value and no, there's nothing wrong with it! Honda Certified with a 7 year/100,000 mile warranty! Special financing rate with Honda Financial Services are available on select models. 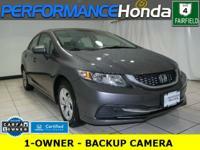 This 2015 Honda Civic has a Crystal Black Pearl exterior and Black interior! Back-Up Camera, iPod/MP3 Input, Bluetooth, CD Player ONLY 21,556 Miles! Buying a Honda Certified Pre-Owned Vehicle is a smart choice. Only well-maintained Honda vehicles that are under six years old and have fewer than 80,000 miles are eligible for certification. The program includes many other benefits that a private seller just can't match, like a thorough 182-point inspection conducted by a team of Honda-trained technicians. Balance of original Powertrain is extended to 7-year/100,000-Mile Powertrain Warranty, Additional 1-year/12,000-mile Non-Powertrain Warranty. 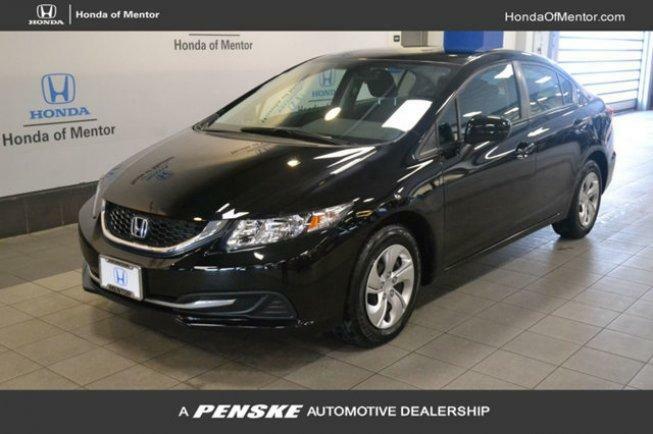 On top of that, we at Honda of Mentor stand behind our Certified Honda's by offering a 3-day "Penske Promise" that allows you the opportunity to return the vehicle within the first 3 days or 300 miles if you are not satisfied with your purchase! See dealer for additional information!